Matza Fun Tours makes your Passover at Ocean Place the ultimate family vacation - peaceful and refreshing. Announcing a Multi Million dollar renovation including all luxurious chic spacious sleeping rooms, suites, ballrooms, fitness center, indoor swimming pool and public spaces. Passover. With one phone call you can book a Passover holiday and Celebrate with a pampered Passover. cuisine, elegant Seders and services, world-class entertainment, non-stop activities, spas, and four-star resorts. At the Ocean Place Resort & Spa, you and your family can escape to an elegant oasis of white sand beaches, gentle breezes, and enchanting waterfront views. Located on a pristine stretch of the New Jersey Shoreline, Ocean Place is a premier Jersey Shore hotel between New York and Atlantic City. At Ocean Place there is a world-class European spa, heated indoor pool, fitness center, and exciting recreational activities. A MatzaFun Tour’s Ocean Place Resort & Spa package include free transportation for teens to Great Adventure on NSCY day, Headline evening entertainment and non-stop noshing at the Ocean View Tea room, FUN Family Theme nights with Western BBQ and Oriental Nights, midnight buffets and “Viennese” Oneg Shabbat, wine tasting, kashrus under Rabbi Zushe Blech, children’s day camp, children’s shows and interactive indoor children’s Carnival Extravaganza. Culinary cuisine by Chef Martin Levin of Mauzone Catering by Celebration from the Culinary institute of America, Author of Chef Marty’s Kosher Kitchen joins us again for Passover 2016.
or call Jay Press at 800.752.6050 or 215.332.2444 Jay Press. 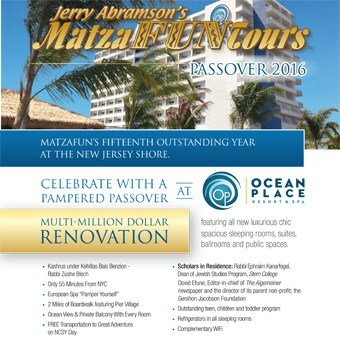 About Jerry Abramson’s Matza Fun Tours For over 28 years, Jerry Abramson’s MatzaFun Tours has been providing the ultimate in service and kosher cuisine for their Passover resort guests. The hallmark of their successful programs is their attention to detail and innovative cuisine that only comes through decades of personal hands-on experience. Their combined backgrounds cover the culinary arts (Jerry began his classical training as a master chef in Europe), marketing (Shelly began her sales career at one of the nation's top food products companies), kosher foods industry, and hotel management. In addition to MatzaFun Tours, Jerry and Shelly own and operate a year-round upscale kosher catering business in the Philadelphia region. They are also kosher foods purveyors, offering exclusive Glatt products and delicacies to the industry. Shelly and Jerry are both very active members of the Cherry Hill Jewish community, serving as volunteers and board members of several institutions.